Before they disappeared some 40,000 years ago, Neanderthals interbred with humans, mixing their DNA with ours. 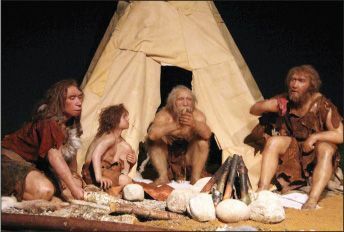 Today, Neanderthal genes make up between 1 and 3 percent of the genetic code of most people with European and Asian ancestry— and a new study says these genes influence how they look, feel, and act, reports the Associated Press. Scientists in Germany analyzed the DNA of a Neanderthal specimen found in the mountains in Siberia and compared it with the genetic data, appearance, and behavior of 112,338 people with British ancestry. (People of pure African descent have virtually no Neanderthal DNA because their ancestors didn’t migrate to Europe.) The researchers found that Neanderthal DNA influences 15 modern human traits, including hair color and skin tone, susceptibility to sunburns, and a tendency to be an “evening person.” Genes passed down from modern humans’ shorter and stockier cousins were also associated with higher rates of loneliness and moodiness. “Most of [the traits] correlate to how much exposure to sunlight you have,” says study author Michael Dannemann. Neanderthals had already adapted to the relatively low and varying levels of sunlight in Europe when they mated with modern humans, the researchers explain. They caution that the influence of genes is subtle and complex, and that dozens or hundreds of genes can play a role in a trait. The moon today is a desolate, airless place, but 4 billion years ago intense volcanic eruptions caused giant gas clouds to shroud the satellite with a thin atmosphere that would have been visible from Earth, new research reveals. NASA scientists analyzed samples of volcanic glasses collected by Apollo 15 and 17 astronauts, and calculated what they meant about the moon’s geologically active period. They found that lunar eruptions once carried enough carbon monoxide, oxygen, hydrogen, sulfur, and other volatile gases to create a temporary atmosphere, which grew faster than it could dissipate into space for about 70 million years. “This work dramatically changes our view of the moon from an airless rocky body to one that used to be surrounded by an atmosphere more prevalent than that surrounding Mars today,” the study’s author, David Kring, tells Phys.org. The researchers noted the volcanic material, rich in chemical elements and compounds with relatively low boiling points, could be valuable sources of water and fuel for crews inhabiting a lunar outpost or embarking on future deep-space missions. People often eat bananas, avocados, and leafy greens for various health benefits. 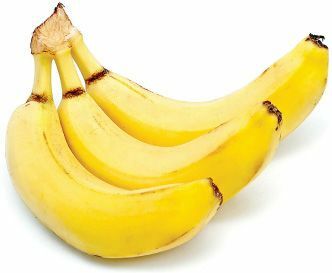 New research adds another benefit: These and other potassiumrich foods may help prevent heart disease, ScienceDaily.com reports. Researchers at the University of Alabama at Birmingham found that a high-potassium diet makes arteries more flexible, and thus could reduce the risk for atherosclerosis, or “hardening of the arteries.” For the study, the researchers fed mice with a genetic susceptibility to heart disease a diet with low, normal, or high levels of potassium. The mice on the low-potassium diet had more severe narrowing and hardening of the arteries than those with adequate potassium intake. High-potassium diets had the opposite effect, suggesting that potassium-rich foods—which also include potatoes, spinach, carrots, and artichokes—could also help prevent heart disease in people.